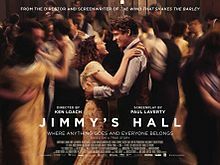 In a summer dominated by blockbusters, Ken Loach gives us this good old-fashioned movie offering based on the true story of Jimmy Gralton, who remains the only Irishman ever deported from the country. Considered a political dissident, the government took advantage of the fact that he carried an American passport, having emigrated there in 1909 before returning home, and therefore declared him an alien, in order to justify the ruling. Since this is a movie though, certain artistic liberties are taken with the tale. Gralton, who is played here by Barry Ward, returns to Ireland after 10 years away in America, and is persuaded to reopen a hall on his land that the locals can use to run classes, teach, and hold dances. This provokes the ire of the Catholic Church, who are determined to shut it down. However, Jimmy won’t yield to their demands, and his radical ideas, together with his reluctance to toe the line, finally seal his fate, as he is removed from the country with only the clothes he stands up in. The real Gralton’s story was somewhat more complex than this movie makes it appear. There are vast political issues running through his tale, which appear somewhat glossed over here. Loach instead focuses on a fictitious love story between Jimmy and local woman Oonagh, who is married to somebody else (the real Gralton was in fact married). When politics are featured they come in spurts, and seem somewhat out of keeping with the tone of the movie. Also, Loach encourages his actors to improvise dialogue, and in certain scenes here it is painfully obvious that the actor is desperately grasping for words, having not had the luxury of a scripted conversation. Ward does a compelling job as Jimmy, and Sherlock baddie Andrew Scott shines as a local priest, but some of the other performances are hit and miss. Also, many of the characters are not terribly rounded, and as a result you don’t really care about them. That aside, this is a sweet film that paints a picture of a forgotten Ireland that was firmly under the thumb of the Catholic Church, and still struggling to find it’s own political identity. Unfortunately, the serious historic elements seem to be treated rather glibly here, in favour of scenes of dances in the hall, which all makes for a lovely, but not terribly deep, story. The editing is also rather choppy, which is quite disconcerting in places, and the movie often seems to just jump around willy-nilly. This could have been an extremely powerful film about a shameful incident in Ireland’s past, but instead it is a nostalgia trip, with occasional heavy moments thrown in, to remind us that Jimmy was a political activist. It looks beautiful and is wonderfully shot, but on the whole, it feels far too light given the seriousness of the subject matter. That said Loach’s films are always worth a look and this is no exception. Just don’t expect to be deeply moved or shocked. Rather you will find yourself basking in the portrayal of a forgotten Ireland, that is at times equally cosy and harsh. However there is something refreshing about watching a movie in 2D with no CGI, and with real actors, so on sheer novelty value alone, this deserves to be seen.